I use RSS Bandit as my preferred RSS Reader. This application is based on .NET framework and has GUI very similar to Outlook 2003 (even some of the Outlook keyboard shortcuts work in this). It also has a built-in tabbed web browser, based on IE engine. This works well until multiple tabs are opened filling up entire space within RSS Bandit browser window. One of the desirable features that RSS Bandit is missing, is an option to open hyperlinks in a default web browser (IE/Firefox). It would have been nice to have a right-click context menu with an option like "Open in Default Browser" or Open in Internet Explorer". Create a .REG file with the following contents. Or download this REG from here. Double-click on this REG file to merge the registry entries. Create a plain text file with the following contents, and save the file as OpenInIE.htm . Or right-click here to save the file in "C:\Program Files\RssBandit" (select Save Target As... instead of directly clicking on the link). This html file can be saved at any other location but ensure that you update the above REG file with the new location (for example - C:\Documents and Settings\Application Data\RssBandit\ where other user specific configurations are stored for RSS Bandit). 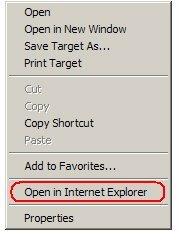 I also use Firefox occasionally and therefore created similar files for a context menu to open links in Firefox instead of Internet Explorer. Download the REG and HTML files for creating "Open in Firefox" entry in context menu. Thanks Raj! Both IE and FireFox files work for me. please visit and leave your valuable comments here..